Two years in a row, I have made my husband Noodles & Company mac and cheese rip-offs for his birthday. Last year, I did Truffle Mac, and this year, I did a vegetarian version of their BBQ Pork Mac & Cheese. I don’t really know how this became a thing for us, but I guess it has. I don’t think anyone can beat us when it comes to non-sensical traditions to mark important occasions, which is okay with us, because mac & cheese is far superior to sappy greeting cards anyway. This item isn’t always on the Noodles & Company menu, but when it was, Chris and I were both intrigued and we wondered if they could sub out the pork for tofu, but neither of us wanted to be that person, so we didn’t ask and for months, I promised him I would try to make a meatless version at home. When tackling this recipe myself, I knew that I couldn’t just use any kind of tofu – it had to be baked! The last thing you want in your mac & cheese are soft cubes of tofu. Baked tofu has a firm, chewy texture because baking in the oven dries it out. 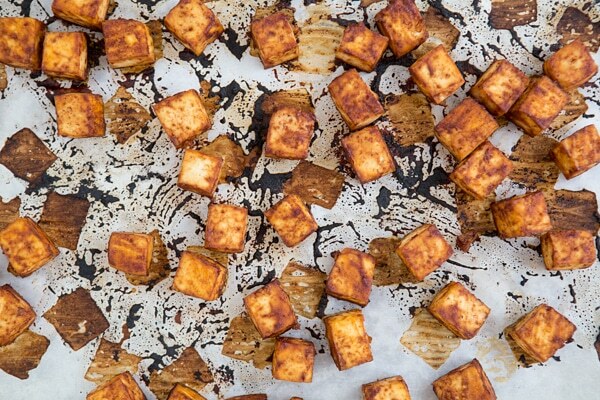 My Baked Barbecue Tofu recipe is one of the most popular posts on Oh My Veggies. It really is tofu for tofu haters! Or at least people who think they hate tofu, because if you still hate it after it’s been baked to chewy perfection and slathered in barbecue sauce, then you really do hate tofu and you can wear that label proudly. Or with shame. Whichever you prefer. I tweaked the tofu recipe a little bit to make it work for this mac & cheese — I cut the tofu into smaller cubes and I skipped marinating it to save a little time. Because I had a big block of smoked cheddar in the fridge, I used that instead of traditional cheddar, which made the finished dish even tastier. Between the creamy mac & cheese and the chewy BBQ tofu, this is the kind of meal that will scratch any comfort food itch you might have. A lot of vegetarians miss the smoky flavor of some meats, like bacon, and if you fall into that camp, this recipe is for you. Press tofu for 30 minutes. Cut the tofu into 1-inch cubes. Transfer it to a bowl and toss it with 1/4 cup of the barbecue sauce, then place it on the parchment-lined baking sheet. Bake the tofu for 20-30 minutes, or until it’s browned on the edges, stirring halfway through cooking time. Put the tofu back in the bowl and toss it with the remaining barbecue sauce. While the tofu is baking, start the mac & cheese. Heat the milk in a small saucepan over medium heat until warm, then reduce heat to low. Stir occasionally to prevent film from forming. In a large saucepan, melt the butter over medium heat. Add the flour and whisk it into the butter. Continue to whisk until the mixture is golden brown, 3-5 minutes. Slowly pour the warmed milk into the flour mixture, whisking constantly. Once the sauce is smooth, let it continue to cook until it’s slightly thickened, about 3 minutes, continuing to whisk constantly. Remove the sauce from heat and whisk in the smoked cheddar. Fold in the macaroni, then season with salt and pepper to taste. Divide the mac & cheese into 4 bowls, then top each one with 1/4 of the baked tofu. Is it wrong to want to dive head first into that bowl? If that’s wrong, I don’t wanna be right. This mac & cheese is pure comfort food heaven!! Looks so creamy & perfect! Love the look of the smoked tofu! Seems divine! I’m all about a nonsensical tradition, especially if it involves mac n cheese! I’ve never been to a Noodles & Company (can you hear me pouting all the way from the West coast?) but I’d bury my face in your version of the mac any ol’ day! Oh man, you need to seek one out because Noodles is AWESOME. It’s like traveling the world. In noodles. Or something. Yeah, I get why tofu can be a hard sell. It took me a long time to warm up to it! Seriously Kiersten, just stop it!!! Smoked cheddar is one of my favourite things on this entire earth EVER. And you’ve gone and done a bbq tofu topped mac n cheese? Well stick a fork in me. I don’t really like tofu, even if I’ve never tried it baked sooooo…maybe you’re right, I’ll completely change my mind about it after trying! Anyway I think this mac & cheese would be perfect even on its own, you had me at the “smoked cheddar”! If you try it baked and you still don’t like it, then you officially don’t like tofu. 🙂 But a lot of people have changed their mind after baking it! I LOVE the sound of this!! I am a big-time bbq tofu lover, and I can only imagine how tasty it is in mac and cheese. Thanks for sharing! I love tofu, even plain!!!! Hehe. But I never thought to bake it! Tks! 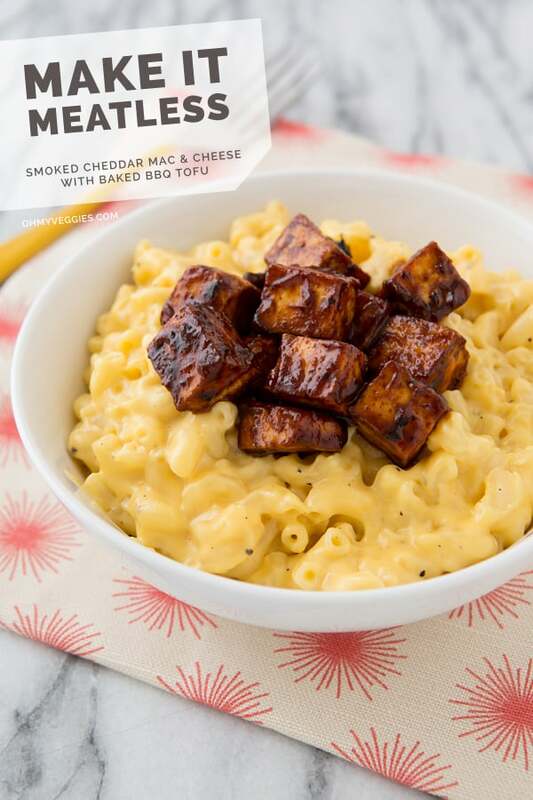 Tofu on my mac ‘n cheese–this is AWESOME! That flavor profile is perfect and I can’t believe I’ve never considered making anything comparable. Thank you for sharing this, I’m excited to try it for our next host dinner! Smoked cheddar mac and cheese???? How could that go wrong? This is such a unique take on mac and cheese?! Who can think of putting tofu in mac and cheese but you girl?!! Loving it! Ha! Well, I used to go to a restaurant where they had a chicken mac & cheese and I asked them to substitute tofu in it instead and magic happened, so I knew it would work. As long as the tofu is baked so the texture is chewy and not slimy, it’s good! Woah, now this is making me hungry right now. 🙂 I have an ongoing love affair with homemade mac n cheese, will definitely have to try this variation ASAP. Me too. I hoard homemade mac & cheese recipes – I have a ridiculous number of them that I’ve cut out of magazines over the years. But I guess hoarding mac & cheese recipes is better than hoarding dead roaches and empty yogurt containers. That looks amazing! I love tofu and mac and cheese and can’t wait to make this-yum just pinned it! This is the ultimate comfort food – I would love to be treated to it on my birthday! I forgot to tell you that I tried your baked bbq tofu for the first time the other week and it was so good! I always thought I didn’t like tofu before and now I can’t wait to make it all the time and use it in different dishes. This mac and cheese would be a good one to try next! Thanks! The great thing about Noodles is that they actually encourage their customers to get wild with customizations! Their tofu is the best that I’ve had anywhere and I have tried many of their meat based dishes with it (I’ve even been known to ask for EXTRA tofu on occasion). This recipe looks fantastic and I can’t wait to try it! I am a huge fan of Noodles too. We used to live a few blocks away from one and ate there waaaay too often, but I never got tired of it. 🙂 The Japanese Pan Noodles are my favorite – always with tofu! I tried to start a mac and cheese for Valentine’s day tradition two years ago, but the.boy DOESN’T LIKE HOMEMADE MAC AND CHEESE. And there is no way I am making the blue box. So now I have a make all the mac and cheese and eat it myself tradition. It’s awesome. I am loving how smoky the flavors in this are! Who would even miss the meat?! Chris always thought he didn’t like mac & cheese, but it turned out he had only had the boxed kind and THAT was what he didn’t like. Now it’s one of his favorite things. 🙂 But I like your tradition of eating it all yourself – that works too! I have made tofu a million and one different ways, and this was definitely one of my favorites! So simple and the texture was awesome. The Mac and cheese was delicious as well, my grocery store didn’t have smoked cheddar so I did half sharp cheddar and half smoked gouda, it was perfect 🙂 thanks for the recipe, it will definitely be made again! Love this recipe! I just made it for my family and my two year old had three bowls! My husband asked for seconds, and he asked that I keep this recipe in rotation! 😀 Thanks! When I was a kid, my dad would cut up hot dogs in mac and cheese–you know, because you need protein. Maybe the kid will eat this!